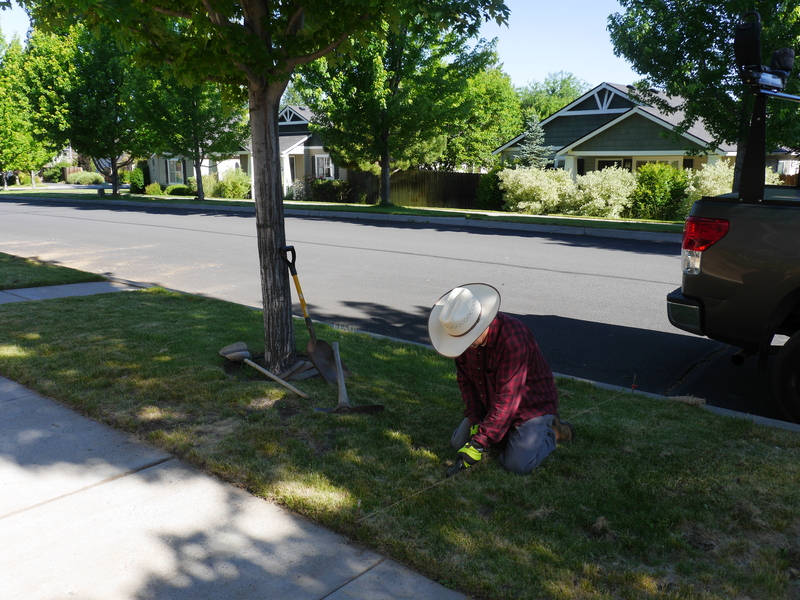 Day 8, 9 and 10: The roots of the trees are winning, Jeff is having a difficult time removing the sod with 2 to 6 inch maple tree roots buried beneath the sod. Averaging 3 strips a day , it’s not going well. Day 11: 8:30 am July 3rd- pressure is building on the time frame to accomplish the xeriscape before the Texans arrive on the 11th. Jeff is just getting started and on his 3rd row with 22′ to go and tree roots getting bigger and more plentiful as he nears the Mother tree. New Neighbors stop by to chat and say it looks well when a Ford PU pulls near the curb with a Dodge PU right behind. Jeff realizes that it is Steve from La Pine who has been taking the sod. He ask the neighbor to look out for the sod loaders have arrived. Arrived they did. Two trucks and 6 people with tools. Jeff says hes sorry but probably only has enough sod for 1 load. Steve informs him that they are not here to just load the sod but to help remove it till it is done and loaded. Jeff not believing his ears. Two hours thirty minutes later as the dust settles and drinks of water and tea with snacks it is done! Jeff can’t thank Steve and his crew enough. This puts him 3 days ahead of schedule. Now the fun begins, with the sod removed we need to prepare, move and modify the existing sprinkler system. So glad Jeff is a retired plumber, so off we go to Home Depot for sprinkler supplies, ground cloth etc. Our total cost for this project so far is remaining zero, but just wait until we return from Home Depot, it could get ugly. pea gravel, metal stakes, fabric pegs, fabric cloth 2 rolls, Plants – 6 mondo grass, 1 hibiscus,, 6 black mondo grass, woolly thymus, pathway lawn edging, irrigation risers, micro tubing, pvc bushings, pvc pipe, 8 drain valves and more gravel for Jeff’s custom pathway. It’s been a major project doing it ourselves, but in the long run we have saved a lot of money and Jeff has lost or sweated off a lot of weight, in another week he says he will have a 6 pack (we will see). LOL. Our neighbor 2 doors down had professional landscapers Xeriscape her yard for over $4000.00. In the long run we hope to save a lot on our water bill and enjoy not feeding, weeding, mowing and grass clippings to go somewhere. So 5 yards of rock to go and the pleasure and enjoyment of our Xeriscaping. More water to our rivers and lakes which is my playground. Updates to be coming upon completion. Family is here and time to play and enjoy the grandkids and the big ones too.